Bharti Airtel and Idea have announced a new plan for their prepaid customers. This new plan has been introduced to counter Reliance Jio’s plan of Rs. 399. Under their new plans, both the operators are offering 84GB data and unlimited calls. Under this plan, Airtel is offering 1GB data per day, unlimited local and STD voice calls, 99 SMSs per day and free outgoing on roaming with a validity of 84 days at Rs. 495. This plan is available only to new customers on their first and second recharge. On the other hand, Idea is offering a similar plan at Rs. 444. Under this plan, the company is offering unlimited local and STD calls, 1GB 4G data per day with a validity of 84 days to users with 4G handsets. Users with 3G/2G handset will get unlimited local and STD voice calls and 2GB 3G/2G data for 35 days. Like Airtel, this plan is available only for new users. As mentioned earlier, these plans have been introduced to counter Reliance Jio’s Rs. 399 plan. To recall, Reliance Jio is offering 1GB 4G data per day, unlimited local and STD voice and video calls, unlimited SMSs and free access to Jio’s suite of apps for 84 days at Rs. 399. It is to be noted that Airtel and Idea restrict the daily call limit to 300 minutes. 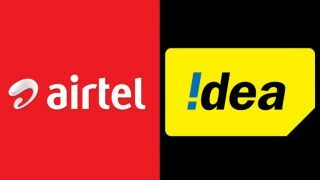 Earlier, both Airtel and Idea had introduced plans to counter Reliance Jio’s Rs. 149 plan. While Airtel had launched a plan at Rs. 199, Idea had introduced a plan at Rs. 198. Under its plan, Airtel is offering 1GB 4G / 3G / 2G data and unlimited voice calls with a validity of 28 days. Similarly, Idea is offering 1GB 4G / 3G / 2G data and unlimited voice calls with a validity of 28 days for Rs. 198. Reliance Jio once again seems like a better alternative as the company is offering 2GB 4G data, unlimited low-speed post FUP data, 300 SMSs and free access to Jio’s suite of apps at Rs. 149.